Ooh, have I got a good one for you today! In fact, it’s so good I’ve had to split it into three posts! Ok part of the reason I’ve split it is because I tend to ramble and I have a shutter obsession so there are lots of pictures. But really, when it comes to cake pictures, more is really more, right? One of the things I love most about cake decorating is learning a new technique and then being able to take it in new directions. Like my Sponged Abstract Buttercream Stripes tutorial, this stripe technique was inspired by Jessica Harris’ Clean and Simple Cake Design Craftsy class where she does some great things with waxed paper, fondant and modelling chocolate. I love that it translates so well into using it with buttercream. In this case we’re basically using the paper like masking tape – masking off some areas and ‘painting’ the rest with coloured buttercream. 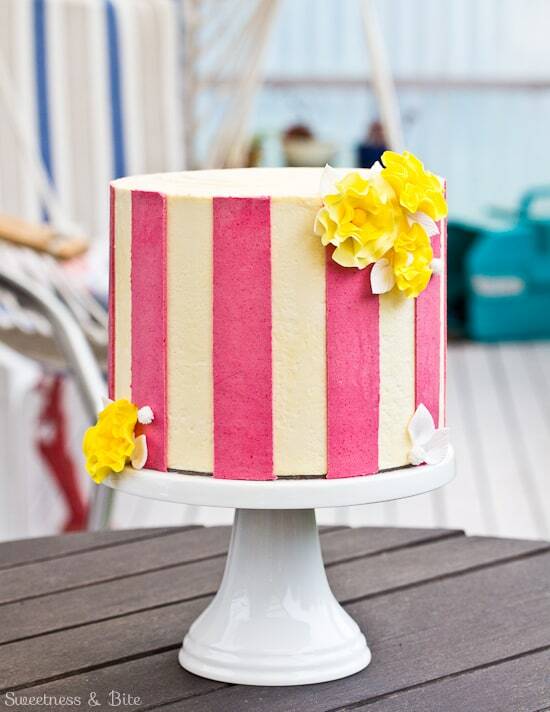 I made this pink striped cake for my Nonna’s birthday in June. I had some raspberry buttercream left over from filling the cake, and I knew I wanted to do something on the outside with it too, but I can’t pipe to save myself. I had this idea for some vertical stripes, and it happened to be one of those awesome (and rare) moments when my crazy idea turned out almost exactly how I’d planned. For this two tier cake (that I made especially for you… Happy Birthday!… or not) I decided to go one step further and make one cake with diagonal lines, which are only slightly more difficult than the straight ones. The important step to making sure you have straight lines is making sure you have straight cakes. 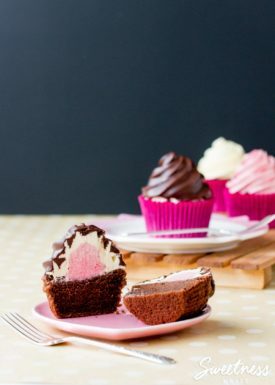 To do this I apply buttercream to my cakes the same way I apply ganache, using a straight angled scraper, a ‘lid’ (extra cake board on top of the cake) and flipping the cake upside down. If you’re familiar with ganaching cakes, this is kind of hybrid of the traditional way and the “upside down” method. If you’re not familiar with it, then don’t freak out, I’ve broken it right down for you! 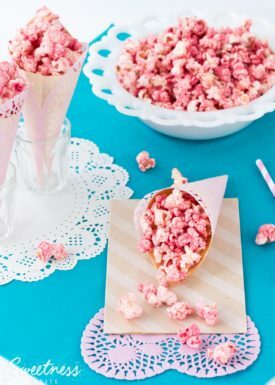 I usually use meringue buttercream (Swiss or Italian) on my cakes so that is what I’ve used here, however I imagine this would also work well with an American crusting buttercream too. One of the little issues with this technique is that some of the buttercream can come away on the waxed paper strips. I don’t mind this too much, but if you like perfectly smooth buttercream I would suggest trying it with a crusting buttercream. When I’m working with two tiered cakes I find it easiest to switch back and forth between the tiers (work on one cake while the other chills, then swap, etc.) but you can do whichever way works best for you. I suggest reading through at least the first two parts of the tutorial before you start, just so you know what’s coming up and where you’re heading. 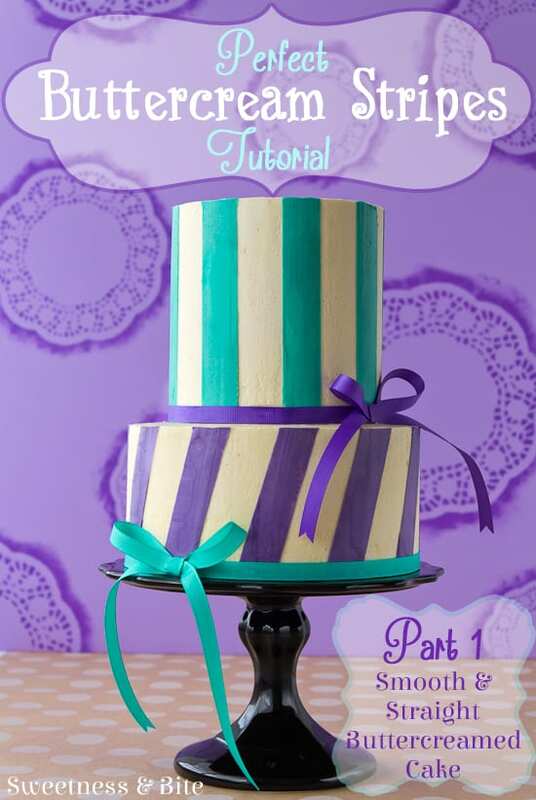 I’ve split this tutorial into three parts- covering the cake in buttercream to get straight and smooth sides, how to do the vertical stripes (including how to make the guides for perfectly spaced and straight stripes) and how to do the diagonal stripes. Parts two and three will be coming soon, in the meantime lets talk about getting this straight and smooth buttercream finish. For my two tier cake I used one five inch tall five inch round cake, and one three inch tall seven inch round cake. 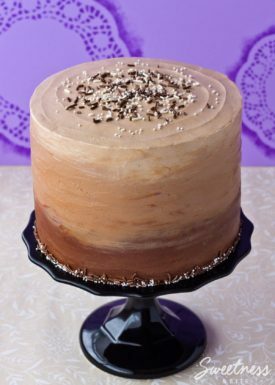 I used one batch of Sweetapolita’s Swiss Meringue Buttercream, which was enough for both tiers with some to spare. Trace the cake board onto both a piece of waxed paper and a piece of baking paper. (I like using the baking paper for when I’m buttercreaming the cake and the waxed paper for when I do the stripes. If you only have one of these then just use that.) Cut very carefully around both circles. Then also trace around the cake board onto a piece of plain paper. My cakes were small so I just used printer paper. Set aside the waxed paper circle and the piece of paper. 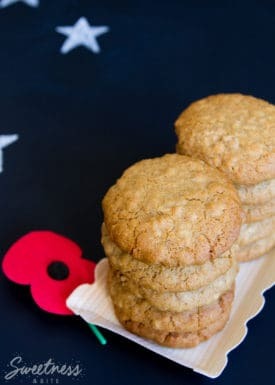 Take your baking paper circle, attach it to one of the 5” cake boards using a few dabs of buttercream and put this in the fridge to set the buttercream. 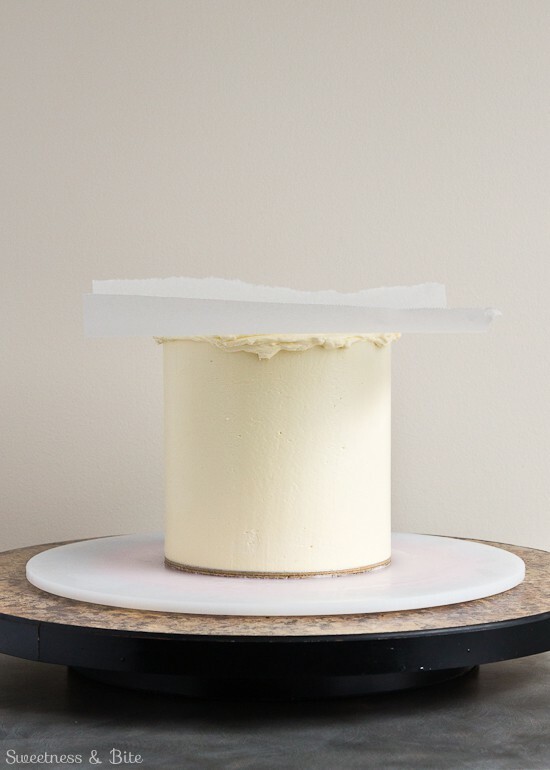 This board will be the ‘lid’ that helps to give perfectly straight sides to your cake, and the paper will make it easy to remove the board when you’re ready. Split your cake into as many layers as you’d like, and trim each layer down so that the layers are ¼“ (5mm) smaller than the size of your cake board. This will make sure you have a nice layer of buttercream on the cake, and it gives you room for both your crumb coat and your (hopefully) crumbless top coat. I have a template cut out from a thin plastic cutting board that I use to do this. 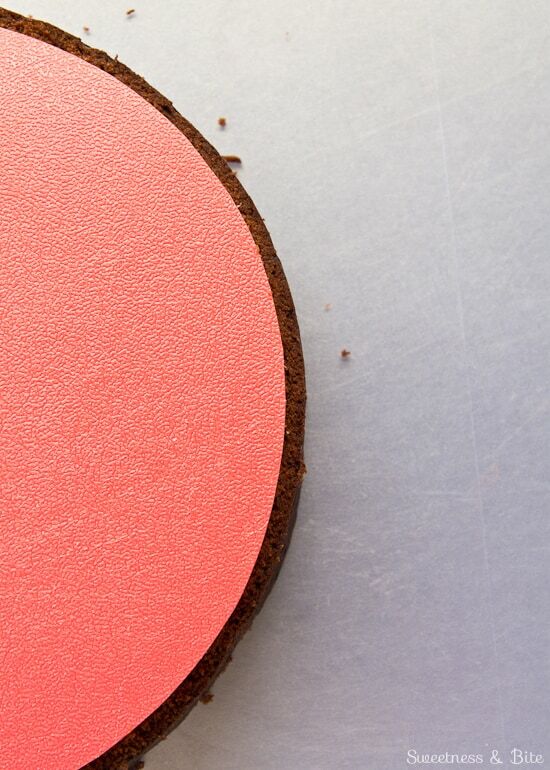 Place a piece of non-slip mat between your turntable and setup board, and then place your other cake board on top, securing with the smaller piece of grippy mat. Stick your first layer of cake to the board with a dab of buttercream, then fill and stack all your layers with however much buttercream you like to use. Spread a thin layer of buttercream over the whole cake. 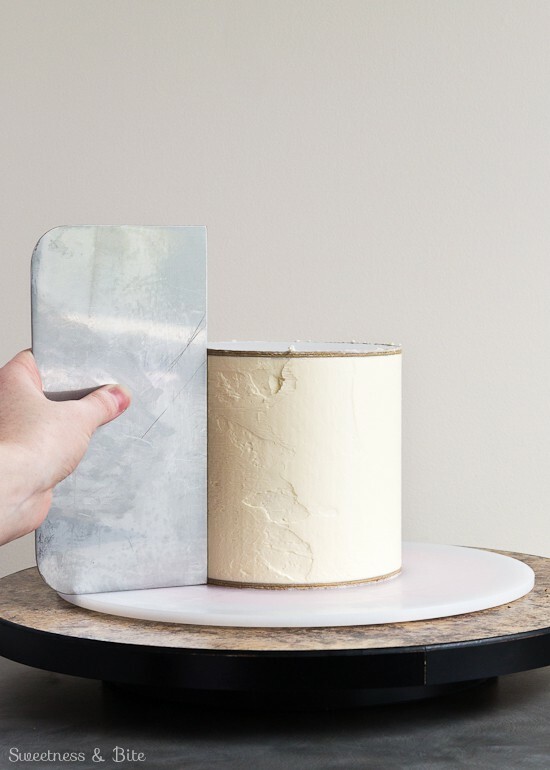 Place the baking paper covered cake board on top of the cake, and use a right angle or scraper to make sure the board is centred, checking with it the whole way around the cake. Refrigerate the cake until the buttercream is firm. Start applying a thick layer of buttercream to the sides of the cake, being careful not to let your spatula touch the crumb coat or you may still pick up some crumbs. Put on a nice thick layer. Grab your right angled scraper and press it up against the cake, making sure it’s pressed up against both cake boards. Scrape gently, turning the turntable until you’ve removed the excess buttercream. Check around the cake for any holes or dips in the buttercream (like the ones in the picture below), fill them in and scrape again. You can rinse your scraper under warm water and dry before scraping the cake again, to help it get nice and smooth. Try not to let the scraper get too hot though or you will melt the butter and you could end up with buttery streaks. Once you’re happy with the sides, put the cake in the fridge and chill it until the buttercream is firm. Slide a spatula under the top cake board, trying to get the spatula between the board and the piece of baking paper. Slide the spatula all the way around the top edge of the cake until the board pops off. Peel off the baking paper. Spread a layer of buttercream over the top the cake, spreading it so it goes a little over the edges on the cake. Place a piece of baking paper over the top of the cake and smooth out any big air bubbles. Place a second setup board on top of the cake, then flip the cake over, so that the cake is upside down on this second board, remove the first setup board and the piece of non-slip mat, and press down gently on the cake. 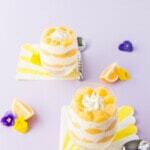 Place a spirit level on top of the cake board and gently press where needed until the cake is level. The buttercream should squeeze out a little around the edges at the bottom. If there are any parts where the buttercream has not squeezed right to the edge of the cake, then use your spatula to add a bit more buttercream to that area. Warm your scraper slightly under warm water and scrape the excess buttercream off. Make sure you keep your scraper straight or you will scrape away the straight sides! Pop the cake back in the fridge until the buttercream is firm. While the cake is upside down, this is also a good opportunity to clean up any excess buttercream on the bottom of your cake board. Flip the cake back over and peel off the baking paper. If it doesn’t come away easily then your cake may not be quite chilled enough, so pop it back in the fridge for a little longer before trying to remove the paper. 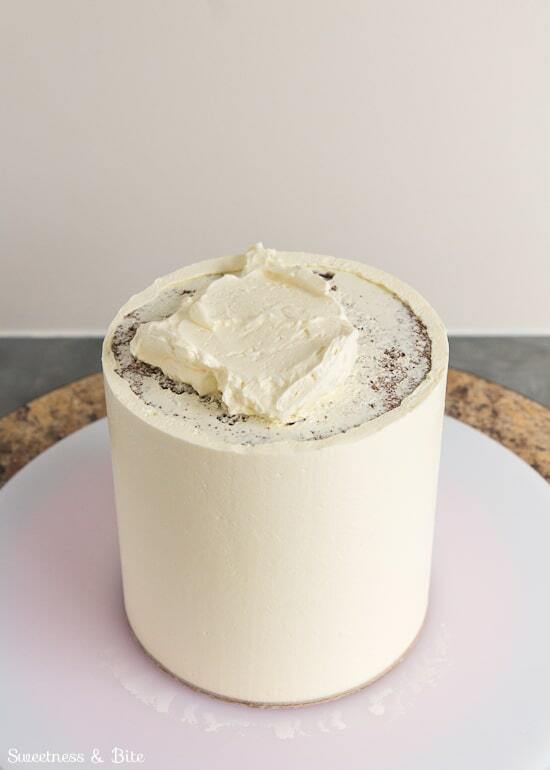 Fill in any little holes on the top of the cake with more buttercream and smooth with the spatula. Warm up your scraper and scrape once more around the sides of the cake. 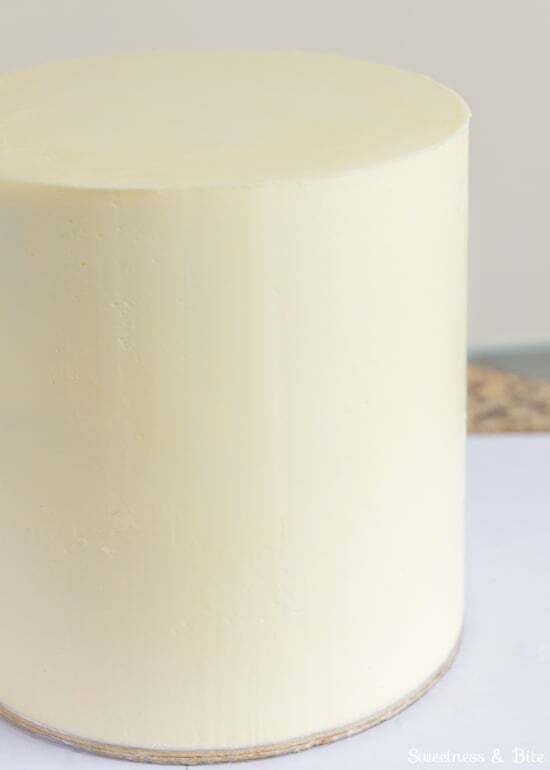 You may end up with a little ridge of buttercream along the top edge, like I have in the picture below- use your spatula to gently smooth it inwards, from the top edge towards the middle of the cake. 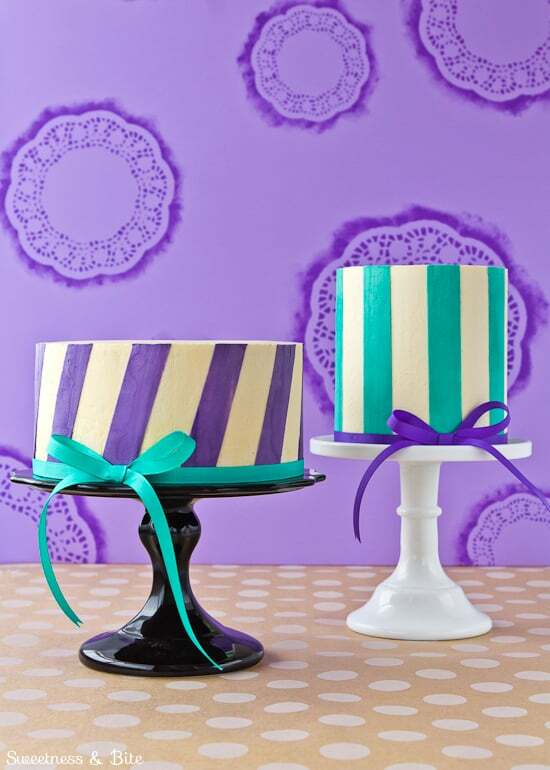 Chill the cake until the buttercream is firm before you start your stripes. The cakes in this post has got to be some of the smoothest I’ve ever seen. It’s like art in all its glory- and you’re the great master behind it! Thank you so, so much for the series- it’s a truly inspirational yet fun read! They’re so beautiful. 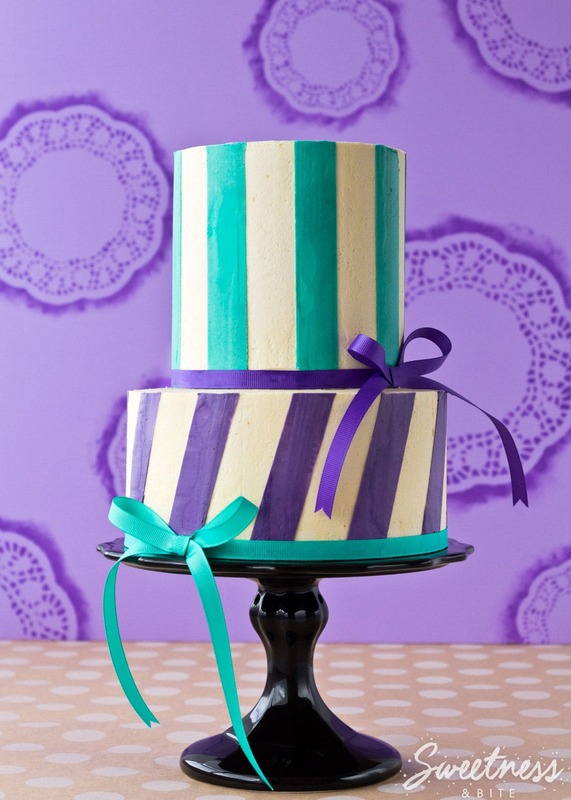 Those stripes in buttercream are really amazing. I haven’t seen anything like it. Fascinating!…can’t wait for the next part. Can you tell me what exactly is that in the 4th photo down. I’m just not sure what I’m looking at. Hi JoEllen! That picture is one layer of the cake, and I’ve placed on top of it a template I made from a plastic chopping board. 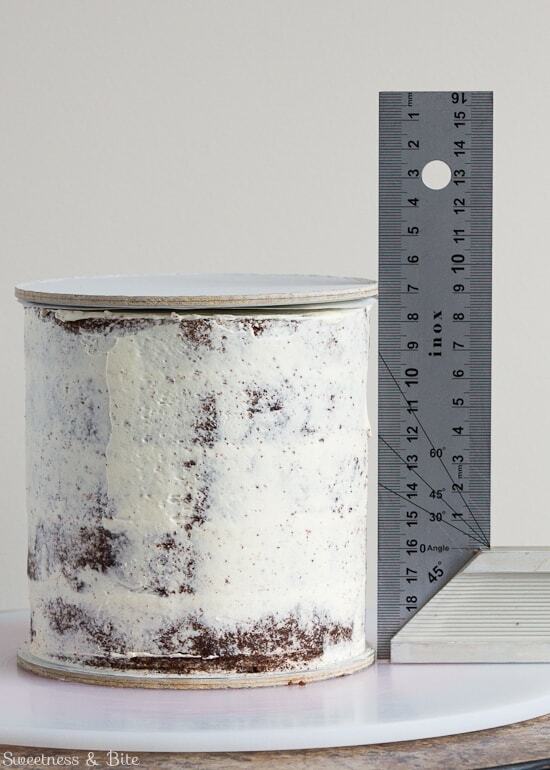 The piece of plastic is 1/2″ smaller than the cake, so when I trim away the excess cake, I end up with a cake that is 1/4″ smaller the whole way around. If you look at the next picture after that one, you’ll see that the cake is then smaller than the cake board. That means I will have a 1/4″ layer of buttercream all the way around the cake. THANK YOU! You are so generous to share your amazing talent with us. I love it, great tutorial, I can’t wait to see how you make the lines. When you turn the cake upside down the butter cream is dry? or you get a mess to remove around? How did you do? Hi Ana. 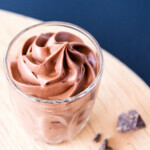 The buttercream should be at room temperature, soft and spreadable. It will squeeze out a little bit at the bottom when you press down, but it shouldn’t be messy. Once I have pressed down to get it level and scraped it smooth again, I take the cake (on the white plastic board that it’s sitting on) and place the whole thing in the refrigerator until the buttercream is set. Then it can be turned right side up. These cakes are stunning! Thank you for sharing your techniques with us! Your instructions are so clear and easy to follow, I wold love to try it. However, I suspect at my skill level my results would not be anywhere near so stunning! Thank you for a very clear tutorial and wonderful results. I will refer my customers to it for further inspiration. Thank you! You just cleared up a whole lot of questions on how to do this! Beautiful job! Thank you, Thank you, Thank you!! Ive been racking my brain trying to figure out this technique, greatly appreciated!!! Cant wait to try! You’re very welcome Samantha! I’d love to know how you get on with it and see your cake! I can’t wait to try this method! 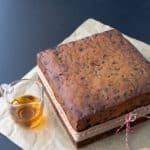 What kind of cake boards do you use? They don’t look like the typical Wilton cardboard cake boards. I’m just not sure I’d be able to get the sides as smooth using the Wilton cake boards since they might not be cut perfectly round. Hi Richard. I think the cake boards that we tend to use in New Zealand (and Australia) are quite different to the Wilton ones. The ones we use are between 2-5mm thick cardboard or Masonite, and covered with foil paper. Sometimes the ones we get aren’t perfectly round either, but if they make little ridges then you can usually smooth them out with a warm spatula once the cake is iced. This is a link to where I get my cake boards to show you what I use, but hopefully you could find something similar online nearer to you. http://kiwicakes.co.nz/kiwi/index.php?cPath=290_353 . I use the 5mm Masonite boards for bigger cakes, but for smaller cakes 7″ and below, the thinner cardboard ones are usually sufficient. Thanks for the info! I will try it with Wilton boards using the method you suggested to get out ridges, just because they’re readily available and cheaper. I’m sure I could find some of the boards you use closer to home too, haha. Love your cakes! I tried this method last weekend with the Wilton boards and it worked great! I did have some small ridges from the rough edges of the cardboard, but once I chilled it and went back over it, it was perfectly smooth. 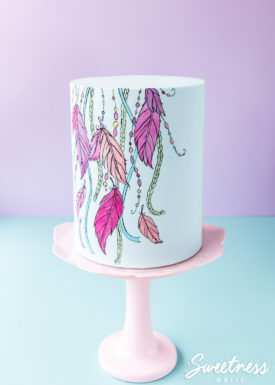 I can’t wait to use this method for a buttercream-finished wedding cake I’m doing this summer! I tried this method last week and loved the results..my stripes were straight and it looked amazing…thanksyou so much for your tips and advise..
Hi Collette, you’re very welcome and I’m so glad it worked well for you! Hi Natalie. Your tutorial is brilliant! One of the best I’ve seen explaining this method. Very simple and straight forward. Thanks for sharing. The issue for me is flipping the cakes upside down and then right side up. I can imagine flipping a 7″ or even 9″. But how on earth do you flip a HEAVY 14″ for example?! What methods do you use and what tips can you share? Thanks! Hi Fran, I can’t actually say that I have tried this method on such a heavy cake, the only real suggestion I can make is to get a big strong man to flip it! Another option would be to frost the sides as described in the tutorial, and then just cover the top with buttercream as you would normally. Then you could scrape around the sides again with a right-angled scraper, and smooth off any bits that are pushed back up to the top. Does that make any sense?! It would be more work to get it perfect, but less risky than trying to flip a big cake over. If you did try to flip it, I would suggest sliding the cake just over the edge of your bench/counter top so you can get a hand under it, using your right hand underneath if you are right handed, then carefully flip it, place the edge on the bench and slide it back onto the bench (rather than trying to put it straight down and then possibly squashing your hand.) If you could get someone else to stand near you as you do it then they can possibly help you out if it looks like it’s slipping from your hand as you flip it. 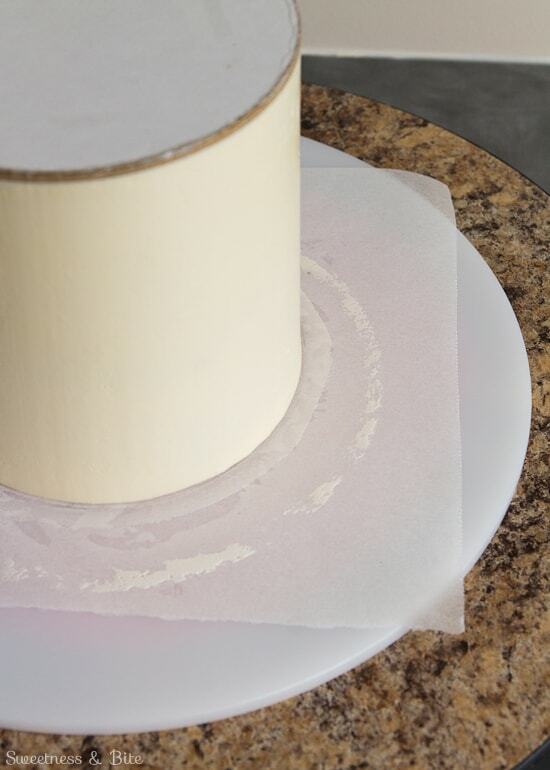 Make sure you have it on good strong Masonite or acrylic cake boards so they don’t bend with the weight of the cake as you flip it from one to the other. Good luck! Hi Natalie. Thanks for responding so quickly. Will be making a cake this weekend and will try to flip it like you suggested. If I chicken out at the last minute then I will use your first suggestion. Thanks a bunch! You’re very welcome, I’d love to know how you get on with it. Sending strong arm wishes your way! Hi Natalie – this is a wonderful tutorial. I am still uncertain about your cake flipping technique however. How on earth do you flip the cake without damaging the icing on the top. I can’t figure out how to flip it without supporting the top somehow. I don’t suppose you have a video clip of you doing this maneuver do you? Hi Sian, I probably didn’t explain that as well as I could have! You can either lift the cake off the board, hold it in one hand and place the setup board on top, then flip it (so it ends up back on the same setup board, and the board supports the cake as you flip), or if you have another setup board you can place that on top (this is what I usually do), lift the cake and the original setup board in one hand, place your other hand on the top, then flip it all over and remove the first setup board which will now be on the top. Then do the bit with the spirit level, chill the cake etc. and then you can flip it back right-side-up in the same way. Does that make more sense? I’ll try and fix up that part of the tutorial now so hopefully it won’t be so confusing! I didn’t get a picture of using the spirit level on the top of the cake when I was doing this tutorial, but if you check out my tutorial post on ganaching a cake, the technique is much the same and there is a picture in that one of the spirit level part. I am so excited to be trying this method out next week. Once I read and reread your blog and got it into my head how it works I immediately got supplies and cut out boards, papers, non slip mats etc , I have a wedding cake , 1st one ever and the bride is having it very minimalistic with very little piping so I need a perfect finish. Was quite nervous about it but now with your tutorial I think it will be ok. , thank you, thank you, thank you. 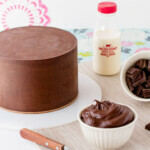 I’d just like to say a big buttercream covered thank you for this post, and the ganache method blog post. I don’t normally use the term ‘game changer’, but this really is. This is truly the most foolproof method. I will never gave to worry about lop sided cakes again. Thank you for your amazing tutorials! I am planning to make a two tiered cake for my daughters christening (feeling a bit sick about it!) and am after some advice. I have never attempted to sugarpaste a cake so was going to use the meringue buttercream. Do you find that when tying a ribbon around it leaves marks? Buttercream is less forgiving than sugarpaste! Also, does it leave greasy stains on the ribbon where it touches the buttercream? Hi Hannah. As long as you don’t wrap the ribbon around too tightly and as long as you wrap it around when the cake is chilled and firm, it doesn’t tend to leave much of a mark. But yes the fat from the buttercream does tend to seep into fabric ribbons. If you look closely at the ribbons on the cake in this post you’ll see it had started to soak into the ribbon. You can help lessen that though by cutting a strip of waxed paper or even acetate the same thickness as the ribbon, and placing that between the ribbon and the cake. Otherwise, you can sometimes find nice ribbons that are plastic-y rather than fabric. Or if you’re ok with giving a little bit of sugarpaste a go, you can roll some out and cut a strip to wrap around the cake instead. The other problem with sugarpaste (and my lack of knowledge) is that I wanted to do a very pale pink bottom graduating into white. Would you use powder like in your water colour tutorial? Thank you so much for your advice, it is very valuable! No worries, I’m happy to help 🙂 If you were using sugarpaste then yes you could dust it with colour. It’s a nice, easy and almost risk-free way to colour as you can build it up gradually. It’s easier to build the colour up slowly with powder than if you were to try and paint an ombre. Hi Khadijah, no I’m sorry at this stage I don’t have a video for this technique. Im just wondering, how do you remove the bottom board once you have finished and turned your cake the right side up? Can you remove the board and replace it with a serving board as you flip it the right side up? I’m a self taught, do this for fun, baker. I just tried this today. Practice will improve my results but the technique is definitely a winner! Made the job much easier. I was trying to link to the cakesafe site, but that link is broken so I googled it. I think I am going to buy the bare essentials kit. Can’t wait to do this again! Hi Gloria! I’m so sorry, I didn’t get a notification of your question so I’m probably a bit late but I’ll answer anyway. No, I don’t ganache my cakes when I use buttercream. You could use white chocolate ganache if you wanted to, but there’s no need to. 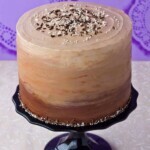 I love Sweetapolita’s recipes, and she has a white cake recipe which looks really good https://www.lorannoils.com/sweetapolita-s-super-white-cake-r0095 .